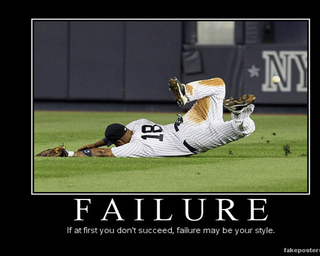 Failures...we have many. I remember my first failure, it happened when I was expelled from my mothers womb...Just kidding. But still, something I learned is, life cannot be the sum of failures, the past cannot be your present, we get to be the best we can NOW, so lets start winning. The worst failure I remember is me walking in school, acting cool with my burger and then suddenly I felt, my face was on the ground, my school pants ripped, and the girl I loved was in front of me...she looked, blushed, and left...I could feel her laughter as she walked behind me. My heart was scarred...but yeah today I'm married to a beautiful and intelligent woman that cannot see me game for more than 3 minutes cuz she gets bored (she loves castle crashers btw). BTW the pic I choose for this post, is similar to how I fell down. What has been the worst failure experience in your life?